School is open from 7.30am at which time the children are supervised by Mrs Baggott in the hall until they are collected by their class teacher at 8.30am. Teachers lead a morning activity from 8.30am. Mrs Baggott will pass on any information or messages you leave to the relevant person. School begins for all pupils at 8.45am when a bell is rung to signal the start of the school day and registration. At 8.45am the children and their teacher go to the school hall for the whole school assembly. If your child arrives after 8.45am. please register your child as being present in the building, this is essential for safeguarding reasons and in case of an emergency. There is a signing in and out book for this purpose on the cabinet outside the staffroom. Infant children – Pre-School, Reception, and Years 1 and 2 finish school at 3.30pm and are dismissed through the back door into the playground. Infant children are only dismissed once their parent or designated person is in the playground to collect them. Junior children – Years 3, 4, 5, and 6 finish school at 3.30pm. The children wait in the playground to be met by their parent or designated adult. Parents are able to access the playground via the side gate on Crompton Way. Any children not collected by 3.40pm are brought back into school to wait in the entrance hall. Children may be collected via the front door after 3.40pm. If your child is not collected by 3.45pm we will book them into the After School Club and you will be charged accordingly. After School Club is available until 6pm, at a charge of £5. This includes a choice of sandwiches and drinks. If you wish to book your child into After School Club please let Mrs Baggott know on arrival or telephone the School Office during the day. We promote healthy eating in School. Infant children may bring healthy tuck to school with them for each of their two playtimes (morning and afternoon). Junior children only have morning playtime and are also able to bring their own healthy tuck or buy brown toast and fruit from the school hall. We kindly request yoghurts are not brought into school as they can easily ruin uniform. A morning drink of milk or water is provided for children in Pre-School up to Year. Children will need their own plastic/unbreakable cup with their name on. Junior children may bring in their own sports water bottle with a pull top rather than a screw top please. This can be filled up and used throughout the day. We kindly request only water for this drink. The school has its own kitchen on the premises. A healthy two course meal is provided daily and all children are expected to partake. If your child has any specific dietary requirements e.g. medical, religious please inform the school in writing and your child will be catered for. The kitchen, headed by cook Julie Baggott, recently received a routine inspection visit from environmental health. 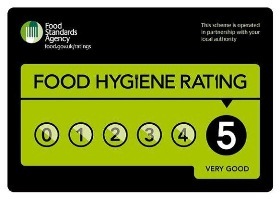 They were awarded a hygiene rating of 5 stars, which is the highest rating which can be given.